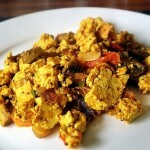 Another must in any vegan recipe collection is a tofu scramble. 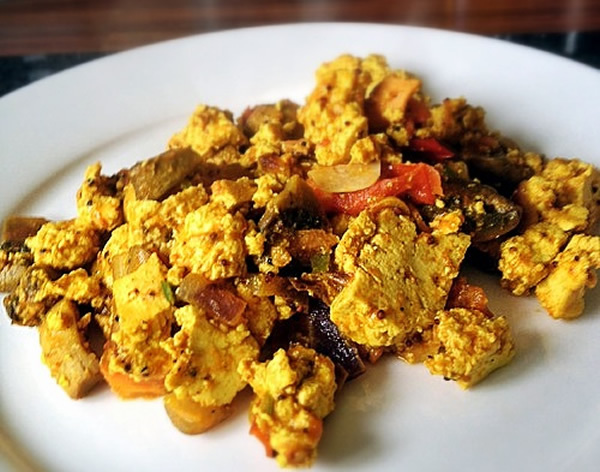 There are various adaptations on my site, but this spicy version takes a basic recipe and gives it something extremely different. This has a wonderful texture and delicious nutty flavour. 1 Heat the oil in a frying pan over a medium heat and fry the onion, garlic and mustard seeds until the onion has softened and turns slightly golden. Add the curry powder/water mix and stir until the mixture becomes dry. 2 Now add the chopped tomatoes and mushrooms and continue to fry over a medium heat for a further 2 minutes. 3 Add the water, salt, pepper, chilli and sugar and simmer for a further 1 minute before adding the tofu. 4 Continue to stir and heat through, allowing the liquid to reduce until you have achieved the desired consistency.